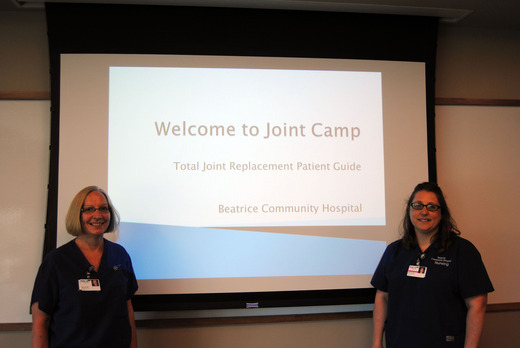 We offer a free monthly Joint Camp to provide you with information about hip or knee joint replacement surgery as well as insights into having surgery at our hospital. No preregistration is required. Our classes are usually held on the third Thursday of each month. We offer some evening and some afternoon sessions thoughout the year. Check the following list to find the day and time that works best for you. We believe the more you know the better your outcome. Please call if you have questions or concerns about attending Joint Camp. Who should come to Joint Camp? If you are scheduled for a total joint replacement, you are strongly encouraged to attend a total joint camp. If you are trying to decide if a total joint replacement is for you. Severe knee or hip pain that limits everyday activities. The ideal time for surgery is often when other measures such as medicines, exercise, weight loss and alternative therapies no longer work. What will you learn if you come to Joint Camp?